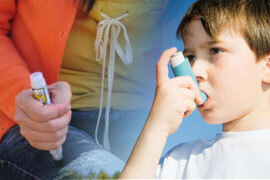 Combined Asthma and Anaphylaxis Management is the industry standard, Asthma and Anaphylaxis First Aid course that meets the Australian Children’s Education & Care Quality Authority (ACECQA) anaphylaxis and asthma management training requirements of child care educators. In the Combined Asthma and Anaphylaxis Management, participants learn the skills and knowledge to provide First Aid treatment for both Asthma and Anaphylaxis. This course is delivered only to group bookings with a minimum attendance or charge of 6 participants. For individuals that have never completed an 22300VIC Course in First Aid Management of Anaphylaxis and 22282VIC Course in Management of Asthma Risks and Emergencies in the Workplace course. Participants are required to complete a 4-5 hour practical training course with assessment. For individuals that have previously completed an 22300VIC Course in First Aid Management of Anaphylaxis and 22282VIC Course in Management of Asthma Risks and Emergencies in the Workplace course. This First Aid course includes both a theoretical and practical component. This assessment includes the completion of two multiple choice theory papers and two practical assessment tasks. 22282VIC Course in Management of Asthma Risks and Emergencies in the Workplace through our partner RTO – Healthcorp – RTO ID 91222. For groups of 6 or more, simply fill out the form below and we will be in touch to discuss your course.